The small, isolated reefs of Christmas Island and the Cocos-Keeling Islands are uniquely situated in the Indo-Pacific, allowing for an intermixing of species that occurs nowhere else. 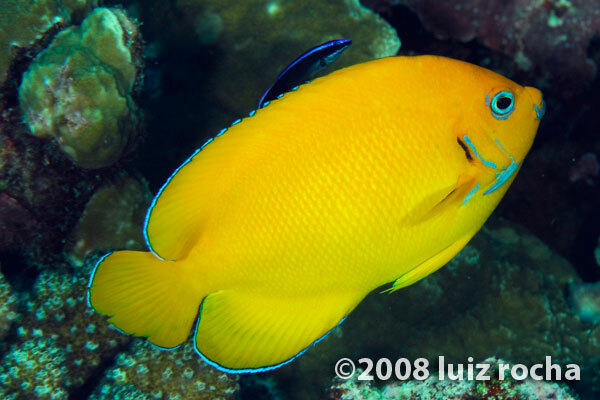 This rampant hybridization is exemplified by the Cocopeel Angelfish, a bright yellow Centropyge endemic to these waters. 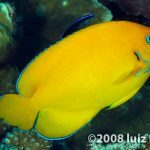 For years, this uniquely colored fish was confused with its yellow congener from the Central Pacific, the Lemonpeel Angelfish (Centropyge flavissima), despite the subtle (but fairly obvious) differences in coloration that serve to separate the two. 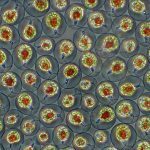 Recent years have seen a flurry of studies published on this fish and its peculiar genetic relationships. You’ll find differing opinions among researchers as to whether the Cocopeel is a genuine species—the name Centropyge cocosensis having recently been applied to it—versus others who would argue that it’s likely nothing more than a xanthic variation of the Indian Ocean’s C. eibli. I’ve written about this in some detail here and here, for those interested in the controversy. And for those who would prefer some amazing underwater footage of hybridization in action, feast your eyes on this video. 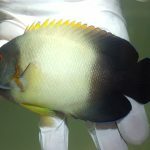 In it, just about every combination of angelfish can be seen making beautiful hybrid babies. 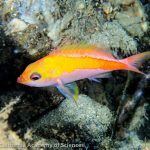 The aphrodisiacal waters of the Eastern Indian Ocean spur these fishes into an orgiastic reverie, spawning with seemingly anything in sight. It’s a wonder that there are any recognizable species left on these reefs given all this genetic intermingling that’s taking place. This is evolution in action, in all its beautiful, messy detail.